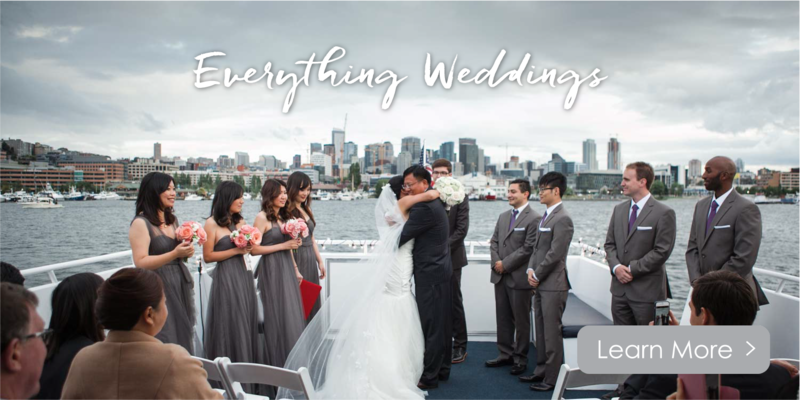 From engagement parties and rehearsal dinners to blowout destination weddings, Argosy Cruises offers a spectacular setting to celebrate your big day. Fleet and Event Spaces – All our vessels are available for private charter along with our event space on Blake Island State Park. Catering – Choose one of our preferred caterers or select your own. The choice is yours! Bar Packages – Our packages feature local producers and flavors, showcasing the best of what the Northwest has to offer. Entertainment – Argosy has established relationships with entertainment partners offering music, games, and more! Wedding Officiant – Bring your own officiant or have an Argosy captain do the honors. Rehearsal Dinners – Let Argosy take care of you, your family, and friends the night before your big day. Day-of Coordination – Experienced coordinators, familiar with every aspect of our vessels are available for an additional fee. Departure Points – While our boats are usually stationed at our home docks on the Seattle Waterfront, Lake Union, and Lake Washington, we can accommodate departure points across the Puget Sound. At Argosy Cruises, we are all hands on deck for the next chapter of your lives! "What a wonderful, beautiful, glorious night. What you people pull off is truly special and you made our wedding night something we’ll never forget. Kristi our planner was fabulous, the captain was great, the entire staff (servers, bartenders, everyone) were amazing. The food was just ridiculously good and we thank you for having an IPA on draft!" "Hi Peter and Megan – I wanted to send a special note of gratitude to both of you for making our wedding so special. Peter, we so appreciated all the support and planning over the last few months as your quick follow up and creative solutions whenever I had a question or worry was awesome!!! Megan, your support and care throughout the entire evening was so amazing and I am still in awe in how you managed everything so flawlessly. I especially enjoyed my dance with the Captain and our guests are still talking about how incredible everything was. We will remember our special day forever!!" "All our guests agreed with Jeff and I - the experience was amazing and phenomenal - one to last a lifetime! The night and sights were beautiful, and the food was delicious. The caterers, Captain and Argosy crew - over the top. Your team understand the meaning of customer service. We had a fantastic time and didn't want the evening to end! Thank you all for making our reception celebration an amazing and extra special occasion. Have a blessed year and thanks again!" Let Argosy take care of you, your family and friends the night before your big day. Relax as our captain and crew take you in and around the waters of Seattle. Looking for another way to celebrate your big day with family and friends, even after the event is over? Why not treat your guests to a post wedding brunch? !